Earlier this week, Brendan Eich, co-founder and CEO of Brave Software, unveiled the latest stats on his fledgling browser, Brave. If Brave continues to grow at its predicted rate, and Coinbase ends up listing Brave’s Basic Attention Token (BAT) on its platform, both may soon come true. What sets Brave apart from its competitors, however, is its unique blend of privacy, ad-blocking and reward system through its cryptocurrency BAT. Chrome has the largest market share. 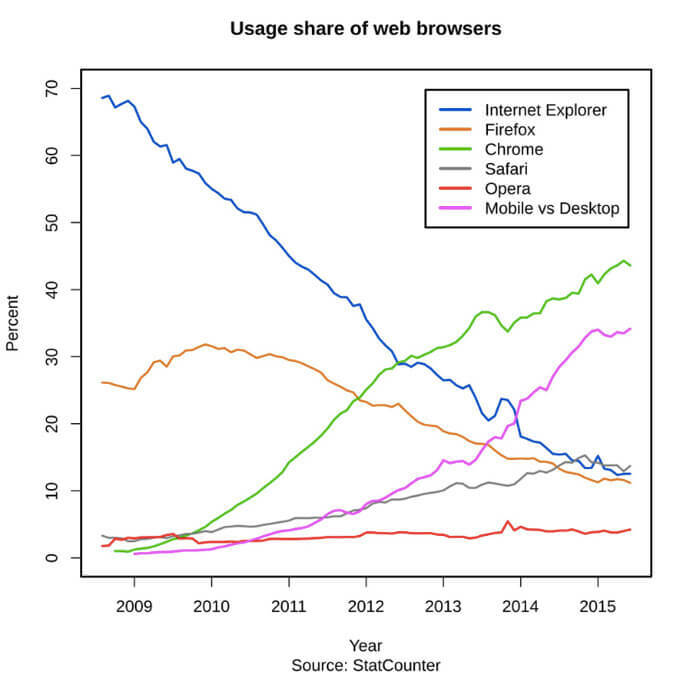 Internet Explorer use has steadily been declining. Brave protects user privacy by automatically blocking all ads, trackers and “fingerprinting” that companies normally use. However, users can control how much data to keep on the browser, which is soon due for an upgrade that will allow it to adopt many of Chrome’s most popular extensions. A secondary effect of blocking unwanted trackers is increased speed and saved money. The Brave browser is up to eight times faster than its competitors Safari and Chrome and estimates that users save up to $276 on mobile data charges by blocking ads and trackers a browser would normally download. While this is good for users, ad blocking traditionally has a negative effect on online companies’ revenue streams, which Brave circumvents with BAT. Brave is also able to solve the dilemma of balancing internet users’ privacy with publishers’ ad-dependent revenue with BAT. Users can earn BAT simply by using the Brave browser. If a user chooses to turn on ads, they are also rewarded part of the ad revenue in BAT, which they can use to anonymously “tip” their favorite websites, YouTubers or Twitch streamers each month. This exchange provides Brave users with a simple introduction to cryptocurrencies while also creating an avenue for publishers to be paid directly by consumers. A company like Buzzfeed, for example, could benefit from this, as it searches for a non-advertisement revenue model. Other companies in a similar predicament have either adopted paywalls, asked for reader donations or forced users to turn off ad-blockers to read content. On July 13, Coinbase revealed that BAT was one of the cryptocurrencies it was considering adding to its platform, and many speculators now believe it will be the next coin added. There are several reasons to believe so. For one, BAT is the “only” ECR-20 token accepted on the Apple Store. This is important to Coinbase, as being listed on the App Stores gives Coinbase a huge advantage over its competitors by keeping the barrier of entry as low as possible. Not having to jump through extra hurdles for BAT is definitely an advantage compared to other cryptocurrencies in consideration. Another reason to support BAT’s listing on Coinbase is CEO Brian Armstrong’s affinity for the project. Armstrong has mentioned or alluded to BAT multiple times and its real-life utility aligns with the visionary’s goals. Additionally, Coinbase listed BAT in a recent product design talk, further fueling the fire. Despite Brave’s progress, it has been unsuccessful in winning over everybody. One tweet, in particular, set off a long tense exchange between Eich and Bitcoin fanatic Francis Pouliot. In 2018/19 many projects that raised money in the ICO craze will realize that their visions are unattainable and their models don’t work. I’ll have utmost respect for the projects that admit their mistake and distribute the remaining money back to their token holders. Pouliot argued that, while Brave was a good product, BAT was a useless token and should refund token holders. Instead of competing with Google and Bitcoin, he advised Brave to adopt Bitcoin and the Lightning Network. Eich countered with the fact that the Brave browser had previously used Bitcoin, with many problems, and the argument soon escalated to accusations of pump-and-dumps, immoral money printing and name calling. While both sides had some valid points, it seems silly for an argument to devolve to such levels. After all, both Pouliot and Eich are working to build a cryptocurrency-friendly future. However, exchanges like this may soon become the norm as the tribalism in cryptocurrencies continues to grow. Perhaps the solution is to let other groups build in peace and let the market decide the ultimate winners. The cryptocurrency community already faces uphill battles including rising pessimism, regulatory hurdles and failed projects. Is self-imposed, ideological warfare really necessary too? The post A Brave New Browser: Is BAT Coinbase’s Next Add? appeared first on CryptoSlate.